Being the best graduate from English Education Study Program, under the faculty of Teacher Training and Education of Palangka Raya University, every one think she is supposed to be a teacher. However, Emmanuela Shinta continues to work in the fields where her English skill will not be in vain. She has been working with partners from different countries all over the world. Shinta is combining her study background and her experience as a speaker in various international forum into a course which is available for both school student or employee who want to elevate their English. 7 days training, 3 hours/meeting, an english course which use learning by Acquiring and experimental method. Through intensive exposure during 7 days, participants are encouraged to elevate their English basic skills (Speaking, listening, writing and reading) to be fluent doer. EE is also designed to enhance the confidence to continually use English through the experience during the training. This course is specifically design for the beginner who want to learn English from basic. It takes place 3 times in a week, with duration one hour/each meeting. The class ends per week and will continue according to the need and request from the student. This class is designed specifically for those who want to edify their speaking or writing skills. The class happens 2 times in a week with one hour duration for each meeting. 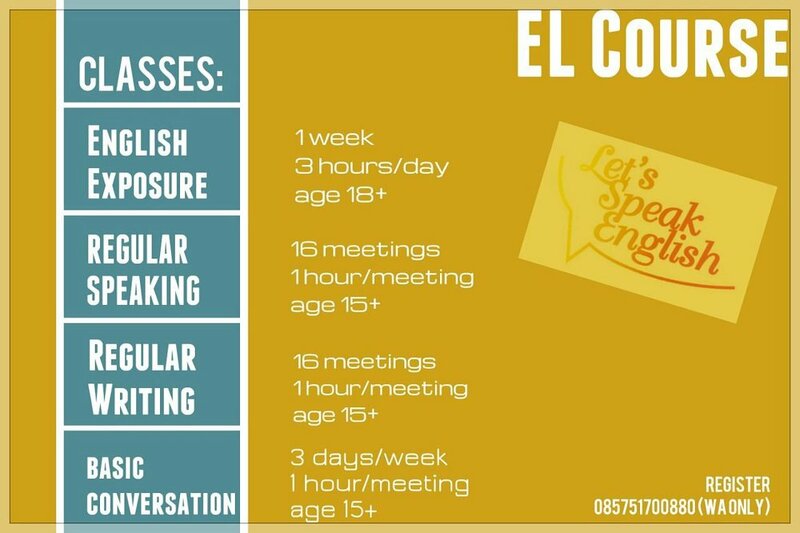 Speaking class will be tutored in English spoken only, while writing class will be full of tight grammar and diction selection lessons. After 16 meetings, you are already able to speak English fluently or either smoothly make an English writing with precise grammar and proper diction.